LET’S GET READY TO ….. Walk-It-Out! Walk-It-Out Walkathon is a Domestic Violence Awareness fundraiser for everyone, students, parents, relatives, friends, community residents and area business leaders. We strongly believe that the goodwill this walk-a-thon imposes will be of huge beneﬁt to our sponsors as not only a Domestic Violence Awareness Month acknowledgement but a goodwill gesture toward the community. In return it will bring awareness to our cause. Just a miniscule amount of your support will make an enormous impact. This year the proceeds will be used to support three well deserved area organizations enhance their services to victims/survivors of domestic violence. 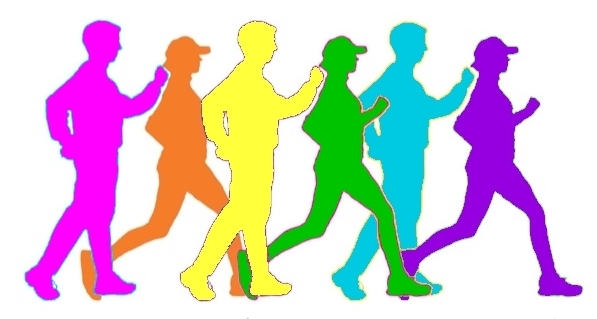 We are very excited about this fundraising event and are asking everyone to put on their walking shoes so that we all have fun with fitness while achieving this goal together. Pledges and donations are tax deductible. Please keep your cancelled check as your receipt. Therefore, as a much-needed fundraiser we are asking for 100% participation to meet our goal. The goal is for every participant to bring in $100 or more in pledges (funds from people supporting the participating walker). For those students who are unable to participate in the walk-a-thon, you can be considered “participating” by paying a $50 donation (buyout fee) per person. Included in this packet is a youth permission slip that all parents must complete before they can participate in the walk-a-thon. All participating youth paying a $50 donation (buyout fee) will be given a complimentary t-shirt and a bottle of water. The permission slip is to be completed and turned in by Friday, October 12, 2018. Please remember that youth cannot enter the walk-a-thon unless the permission slip is returned. We welcome everyone and anyone, including parents, other relatives, friends, coworkers, etc, to participate in the walk-a-thon. A registration/waiver form the walk-a-thon is included in this packet. The entry fee is $20 Adult/$15 Youth 13-16. Also, all are welcome to order a t-shirt for $10 per shirt online prior to the event. All checks should be made payable to “Pneuma Life Foundation” or “PLF”. Please complete and return the signed registration/waiver on/or before the day of the walk by Saturday October 20th. Pre-register online early and save $5 for participating adults and youth. We hope that every participating walker will be able to bring in at least $100 in pledges. We encourage each walker to get as many people supporting them in the walk-a-thon as possible. A solicitation letter is attached with the pledge form to help you get sponsors for the walk-a-thon. If a company has a donation match program for charitable giving, you may consider asking the company to match your walk-a-thon pledges. Please mark the sponsor sheet in the Matching Donor column so that the proper paperwork can be completed and receives credit for the matching donation. Friday, October 12th to be eligible to receive a goody bag.